This chocolate-making workshop is all about chocolate-making in a dream setting. Learn the how, where and what it's all about. Walk away with a box full of your very own hand made delights. Professional foodies and chocoholics alike will simply love this beginners’ chocolate-making workshop. To begin with, Sylvia, a professional chocolatier, will talk you through the process of turning cocoa beans into a block of chocolate and give you some tasty information on the history of chocolate. Then you’ll be ready to temper the chocolate and turn it into chocolatey delights! Correct tempering of chocolate is the key to perfectly-made delicacies. During the workshop you will work with only the highest-quality Belgian couverture chocolate, which averages over 64% cocoa. You’ll make ganache filling, choose your own flavouring and pour into moulds that are the same as those used by the world’s top chocolatiers! You will also get to call on your creative side when making little curls and other decorations for your chocolates. Throughout the four-hour class you’ll make a variety of chocolates and decorations – all of which you’ll get to take home with you afterwards! Everything is done to the highest professional standard and the atmosphere is all about fun. One of the best things about this class is the size. With no more than eight participants in the group you will all work together and receive all of the attention you need in order to bring out your innermost chocolatey creative flair! 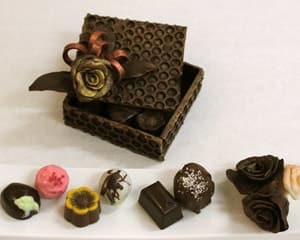 This course is ideal for the chocolate-lover who wants to learn about the intricacies of chocolate appreciation and learn how to make goodies for themselves, or as gifts for others. Any professional cook or patisserie chef who wants to hone their skills in chocolate-making will also benefit greatly from this workshop. Whatever your motivation, you will walk away from this workshop knowing all about the full potential of chocolate and with a box full of chocolaty treats. This is a fun-packed four hours that you won’t forget! We suggest that should you have any special dietary requirements you inform us at time of booking ie. allergy to nuts dairy alcohol or fruit etc. The 4hr workshops are held on Monday, Thursday or Friday evenings from 6-10pm or on Saturdays between 2- 6pm. Some of these questions don't apply to me as I received this voucher as a gift. The chocolate making class was the best course I have taken so far. Sylvia is lovely and is a true chocolate lover and connoisseur. I totally enjoyed the experience and will recommend my friends to take it. Very pleasure experience, totally recommend to any chocolate lovers. Thankyou & keep up the great work! We absolutely loved everything about our chocolate making experience and hope to do some more advanced classes in the future. It was the first time we used Adrenalin but it will now be our first port of call when planning outtings or looking for unique gifts. Sylvia was very professional and totally knew her subject. I was grateful for the information booklet as there was so much content my brain was not capable of retaining it all. A lovely lady. The chocolate making class was excellent. Yes, I could have driven a Ferrari all over Melbourne, but the lessons learned from a class about food, will last a lifetime. The chocolate we made lasted about three days ! It was a great adventure. The chocolate course was fabulous and totally yummy. I loved receiving the chocolate course as a gift. I now have an even greater appreciation of chocolate! The course was fun and I even came home with my very own box full! Was such a great course, very inspiring, the ladies knowledge was incredible and very patient to teach the tricks!